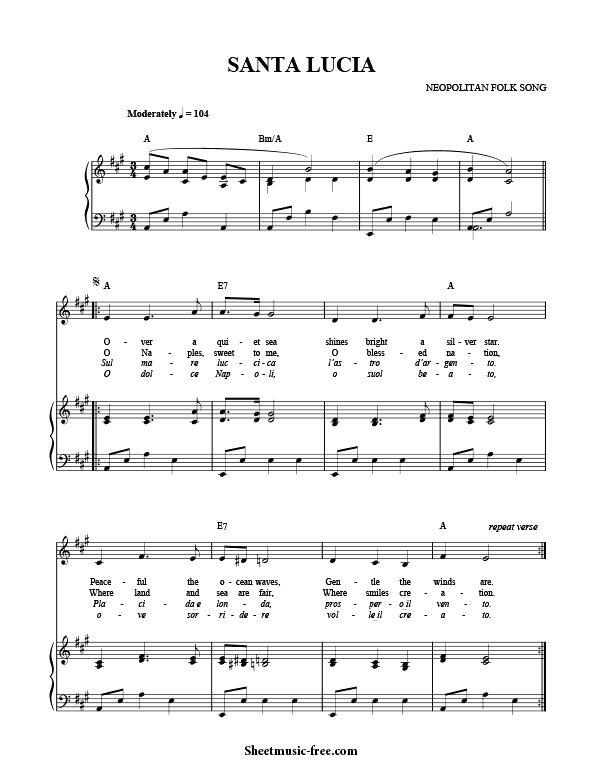 “Santa Lucia Sheet Music” from Napolitan Folk, “ Santa Lucia Sheet Music” for Piano / Vocal/ Chords , Original key: A Major, number of pages sheet music PDF: 2, Video and Lyrics song Santa Lucia Sheet Music. “Santa Lucia’” is a traditional Neapolitan song. It was translated by Teodoro Cottrau (1827–1879) into Italian and published by the Cottrau firm, as a “barcarolla”, in Naples in 1849. Santa Lucia Sheet Music Napolitan Folk. The original lyrics of “Santa Lucia” celebrate the picturesque waterfront district, Borgo Santa Lucia, in the Bay of Naples, in the invitation of a boatman to take a turn in his boat, to better enjoy the cool of the evening.